Days away from a holiday where many will eat to excess with the centerpiece of the meal being a doomed turkey, Farm Sanctuary is campaigning for people to help save the creatures, instead of eating them. For a 20th year, Farm Sanctuary is running its Adopt a Turkey Project, encouraging people to save turkeys at Thanksgiving when so many are killing them. This year, in addition to their regular adoption where a donation of just $30 leads to sponsorship of a currently living turkey, Farm Sanctuary is also offering a memorial pledge. 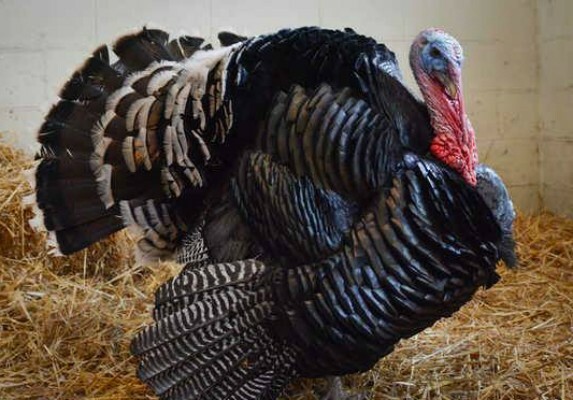 “For a one-time donation gift of $50 you can pay homage to Turpentine, and the 45 million turkeys who are slaughtered for Thanksgiving every year,” says the site. Turpentine was a mainstay at Farm Sanctuary, a social and animated character that seemed to love company and love the camera. Robin, Jackie, and Christina, who reside in the New York Shelter are all up for sponsorships, as well as Pamela and Pepper from the Northern California location. For $200, you can sponsor the entire flock. To sponsor a turkey or make a memorial donation, you can visit the site here. If you’re not convinced, check out this infectiously lovely turkey video from 2012.